A Sweet Dessert for our Sweet Love ! Valentine’s Day is a day to show our love and affection towards each other or significant others. Valentine’s Day is one of my favorite holidays; however, the first word I think of when I hear Valentine’s Day is chocolate. The best present that someone could get me for Valentine’s Day besides roses, would be any kind of food related with chocolate. My family tradition for Valentine’s Day is a chocolate dessert. The Molten Lava Cake is the dessert my family makes for Valentine’s Day to express our sweet love to each other. 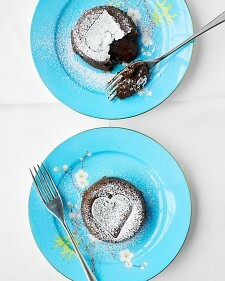 The Molten Lava Cake is a great dessert for Valentine’s Day or even any time someone is willing to bake it. To create this delicious dessert, follow the recipe and instructions below. 1) Preheat oven to 400 degrees; Butter two 6-ounce ramekins, then dust with sugar. 2) Place butter and chocolate in a microwave-safe bowl. Microwave on high in 20-second increments, stirring after each, until melted. Let cool slightly. 3) In a small bowl, whisk together egg, yolk, sugar, espresso powder, and salt. Add chocolate mixture; whisk to combine. Add flour, and whisk just until combined (do not over mix). 4) Then, pour batter into prepared ramekins (Recipe can made up ahead until this point). 5) Bake until a toothpick inserted 1/2 inch from the edge of ramekin comes out clean, and a toothpick inserted in the center comes out wet. 6) Bake for 10 to 12 minutes (do not over bake ). 7) Cool 10 minutes on a wire rack; run a knife around the inside of the ramekins to loosen. 8) Invert cakes onto serving plates, dust with sugar and serve immediately. Enjoy The Molten Lava Cake!